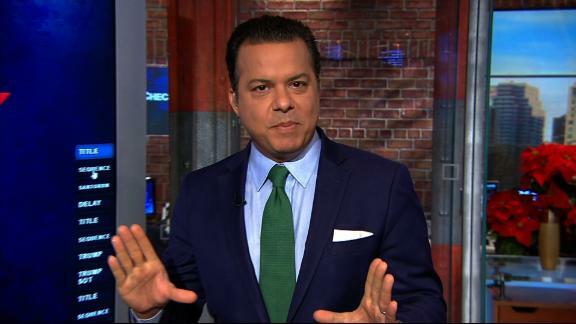 CNN's John Avlon looks at the partisan push back over the Trump administration's climate change report. Before boarding Marine One on the way to a political rally in Mississippi on Monday, President Donald Trump answered a few questions from reporters. When asked about a 1,600-page climate change report compiled by 13 federal agencies and over 300 leading scientists, Trump responded that he did not believe the report's findings, including that the damage from a warming planet would reduce the US economy by 10 percent by the end of the 21st Century. "I don't believe it," Trump responded. White House Press Secretary Sarah Huckabee Sanders reiterated the President's comments during a press briefing a day later, stating that the report is "not based on facts" but based on "the most extreme modeled scenario, which contradicts long established trends." The topic of climate change is obviously politically charged. The report, put together with the help of 1,000 people, including 300 leading scientists, roughly half from outside the government, is designed to cut through that partisanship. Dubbed the Fourth National Climate Assessment, the report was issued by the US Global Change Research Program, a team of 13 federal agencies, and is the second of two volumes. Given the President's past denials of climate change and his administration's efforts to reverse the polices of the Obama administration to address its effects, the report puts the White House in an awkward position of having to disavow the research of its own government. Here is a fact-check of some of its responses. Fact check -- Sanders: the "report is based on the most extreme modeled scenario"
This is wrong. The report evaluates a number of scenarios from best to worst case. The scenarios "span a range of plausible future changes in key environmental parameters" including variations in temperature, sea level rise and population, according to the report. These scenario products "help ensure consistency in underlying assumptions across the report," it states. Penn State Earth System Science Center Director Michael Mann, a leading climate change scientist, contradicted the White House's claims. "As is often the case, the opposite of what the White House claims is true. If anything, climate models have historically underpredicted the impact of climate change on ice melt, sea level rise, and increases in extreme weather," Mann told CNN. Sanders said that the "extreme modeled scenario" used in the report "contradicts long-established trends." To the contrary, the Climate Science Special Report which provided the scientific foundation for this report actually states that the observed trends over the last 15-20 years are consistent with the higher emission scenarios. Fact check - "Right now, we're at the cleanest we've ever been." It's unclear exactly what Trump is referring to here. In response to the report, the White House cited a statistic from the US Energy Information Administration -- since 2005, the country's energy-related CO2 emissions have declined by 14 percent, even as global emissions continue to rise. While the statistic itself is accurate, much of that reduction is the result of power plants switching from coal to cleaner burning natural gas over the past decade, according to the EIA. Trump has made reviving the coal industry a key part of his energy policy. In August, the EPA introduced the Affordable Clean Energy rule, which shifted the power to regulate coal power plants' carbon emissions from the federal government to the states. In September, the EPA released a proposal that would relax requirements for how energy companies monitor and repair methane leaks. In February, 2017, President Trump signed an executive order asking the EPA to review Obama-era water regulations to make sure they were not harming the economy. "I am taking historic steps to lift the restrictions on American energy, to reverse government intrusion and to cancel job-killing regulations," said Trump. The EPA and the Department of the Army are in the process of reviewing the Waters of the United States act created in 2015 under President Obama. "There is nothing green and clean about gutting climate policies and locking us into future impacts that will disrupt lives, bring irreversible changes to ecosystems, topple infrastructure and hurt our economy" said Kelly Levin, a senior associate with the World Resources Institute's global climate program. Levin, who co-authored a report of the United Nations Environment Program released Tuesday that highlights global climate emissions, told CNN, "the rollbacks of the Administration will lead to greater climate pollution." Fact check- the next report will "provide for a more transparent and data-driven process." The White House statement called for the need for greater transparency and claimed that the next NCA, due out around 2021, will give an "opportunity to provide for a more transparent and data-driven process that includes fuller information on the range of potential scenarios and outcomes." But according to Katharine Hayhoe, one of the report's lead authors, the process couldn't be any more transparent. "This is the most transparent scientific report I have ever been a part of, by far," Hayhoe told CNN. Hayhoe detailed how every step of the process was open for review, including making the rough draft open for public comment. The authors were then required to respond to every single public comment made on the draft, as well as opening the review process from other scientific entities such as the National Academy of Sciences.